The cost of housing in New York and San Francisco has long since transcended into the realm of absurdity. But all those quaint, astronomically pricey brownstones and single family homes are part of a healthy national economy, right? Not exactly. An interesting study titled Why Do Cities Matter?, published today on the National Bureau of Economic Research and pointed out by New York Mag, looks at how three cities—New York, San Francisco, and San Jose—impact the overall health of the US economy. The authors studied how these three cities have changed since the mid-1960s, tracking how the increasing demand for workers has contributed to the health of the US economy at large. What they found was startling: Even though the trio of cities had tons of local growth, they’re not contributing to the national economy as much as other smaller cities, like those in the Rust Belt and the South. According to authors Chang-Tai Hsieh and Enrico Moretti, there’s a fairly simple reason for that: The high price of housing. Even though there’s plenty of demand for workers, there’s essentially no place for them to live, since each of these three cities have strict land-use regulations that have prevented density-enhancing development in key areas. Take suburban San Jose, for example. It’s near Silicon Valley and San Francisco, and housing is in high demand. But land use restrictions have prevented growth. “In a region with some of the most expensive real estate in the world, surface parking lots, 1-story buildings and underutilized pieces of land are still remarkably common due to land use restrictions,” write the authors. That lack of housing has effectively placed a stranglehold on the growth of these three cities—which, though they’ve exploded as high value areas, could have contributed much, much more to the health of the US economy if they had more housing. How much more? The study actually does the math, setting up a scenario where strict land-use regulations were relaxed to the level similar to those in the rest of the country. Such a change would boost growth in the US by a staggering 9.7 percent. We’d all be making more money. “In levels, U.S. GDP in 2009 would be 13.5% or $1.95 trillion higher. This amounts to an annual wage increase of $8775 for the average worker,” the authors write. So Should We Just Go Wild? Such huge numbers lead us to wonder why on Earth these cities haven’t eased up on their land-use laws. 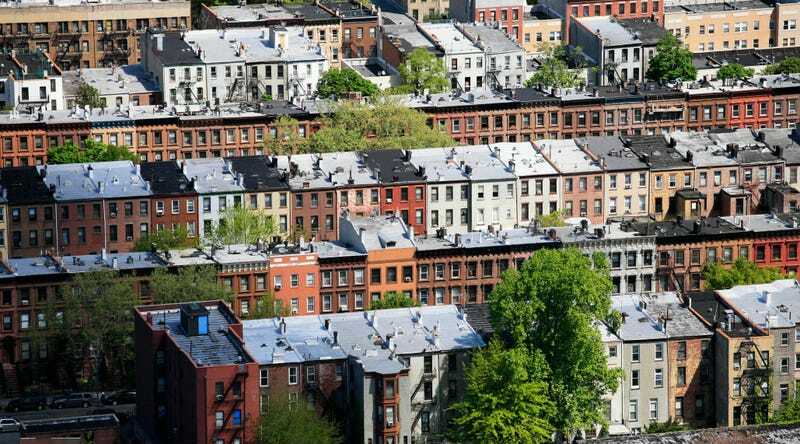 On New York Mag, Annie Lowrey aptly describes the adorable townhouses and low-rise architecture of desirable neighborhoods like Park Slope as a “total economic disaster,” which is tough to argue with given the evidence presented in the study. It’s still worth pointing out that easing up on land-use laws could have multiple unintended consequences for our cities, though. The debate over how deregulation would affect New York’s housing market, for example, has raged since the 1980s. Some critics argue that getting rid of land use regulation would be negative for the poor who benefit from low-income housing in cities and create pockets of extremely poor-quality housing, even if it is more dense. Others say that land-use regulation in the city would actually make housing more fair. In short, it’s a way, way more complex issue than the binary “build nothing or build anything” argument the study tempts us to set up. Cities are complex organisms, and in the end, studying their evolution in retrospect is far easier than predicting it in advance.